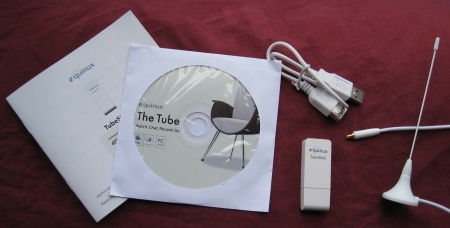 The Equinux TubeStick is the smallest Freeview TV receiver we’ve come across. Not much larger than a standard USB memory stick, this is a powerful TV receiver that lets you watch and record Freeview, stream live TV to your iPhone, and schedule recordings remotely from a browser. Although primarily a Mac product, the TubeStick can be used with a PC too – although you don’t get the nifty features you get with the supplied Mac software – instead, you use it as a basic receiver and use Windows Media Center to control access to the channels, and recording. 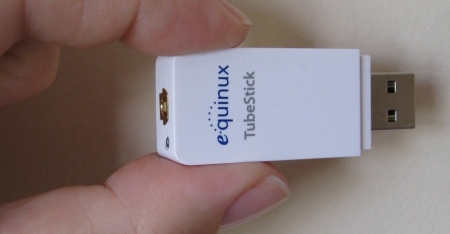 We reviewed the Equinux TubeStick in Show 42 of our podcast. The Tubestick is a truly tiny receiver – it plugs into a standard USB port and accepts an aerial via the mini-coax connector at the top. 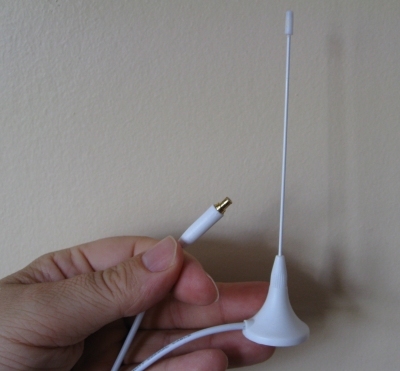 The Tubestick is supplied with an aerial which connects to the USB’s mini-co-ax. The aerial has around 1 metre’s worth of cable. 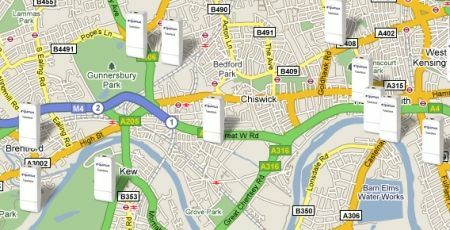 Unless you’re in a fairly strong Freeview coverage area, the aerial is unlikely to be of much use (due to the weak nature of Freeview signals), so you’ll get best results connecting to a rooftop aerial. For that purpose, an adapter is provided that converts a standard TV aerial co-ax plug to the TubeStick’s micro USB connector. Here’s where we have to come clean. Here at Radio and Telly, we’re not Mac users – we’re PC boys. So, we’ve not been able to try out the lovely Mac software that comes with the TubeStick. The software also includes BuddySurfing, which allows to you chat in real-time with your mates during a TV show.